This story was originally published on BuzzFeed. Richard Linklater’s new movie Boyhood was shot over the course of 12 years and follows its protagonist, Mason Jr. (played by Ellar Coltrane), as he grows up. 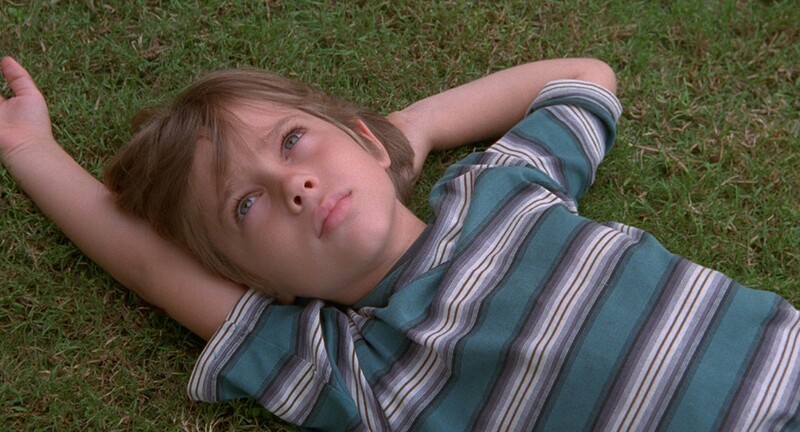 Linklater recruited a team of young people to pick the songs that make up Boyhood’s ’00s childhood-evoking soundtrack, which features Coldplay, Cobra Starship, and Vampire Weekend. But there’s one moment in the film dedicated to the kind of music that has no time stamp, always sounds good, and travels from one generation to another. In a scene celebrating Mason Jr.’s 15th birthday, he receives a mix CD from his father, Mason Sr., played by Ethan Hawke. Called The Black Album, it’s a compilation of the best of John, Paul, George, and Ringo’s solo work, post-Beatles. Boyhood captures a family in chaotic real time, and as its actors aged over a decade-plus of filming, the movie absorbed some of their actual lives. The Black Album you see on screen originated IRL, as a real gift from Hawke to his oldest daughter, Maya. Hawke wrote the original version of these Black Album liner notes for Maya, then slightly retooled them while he was working on Boyhood. The result is a heart-wrenching reflection on the magic that can happen even after a family-type unit breaks up and the special bond forged between parents and kids when the latter come to know, and respect, that the former are not perfect. I wanted to give you something for your birthday that money couldn’t buy, something that only a father could give a son, like a family heirloom. This is the best I could do. Apologies in advance. I present to you: The Beatles’ Black Album. The only work I’ve ever been a part of that I feel any sense of pride for involves something born in a spirit of collaboration — not my idea or his or her idea, but some unforeseeable magic that happens in creativity when energies collide. This is the best of John, Paul, George, and Ringo’s solo work, post-Beatles. Basically I’ve put the band back together for you. There’s this thing that happens when you listen to too much of the solo stuff separately — too much Lennon: Suddenly there’s a little too much self-involvement in the room; too much Paul and it can become sentimental — let’s face it, borderline goofy; too much George: I mean, we all have our spiritual side but it’s only interesting for about six minutes, ya know? Ringo: He’s funny, irreverent, and cool, but he can’t sing — he had a bunch of hits in the ’70s (even more than Lennon) but you aren’t gonna go home and crank up a Ringo Starr album start to finish, you’re just not gonna do that. When you mix up their work, though, when you put them side by side and let them flow — they elevate each other, and you start to hear it: T H E B E A T L E S.
Just listen to the whole CD, OK? I guess it was the fact that Lennon was shot and killed at 40 (one of Lennon’s last fully composed songs was “Life Begins at 40,” which he wrote for Ringo — I couldn’t bring myself to include it on the mix as the irony still does not make me laugh) and that I just turned 40 myself that conjured this Black Album. I listen to this music, and for some reason (maybe the ongoing, metamorphosing pain of my divorce from your mother), I am filled with sadness that John and Paul’s friendship turned so bitter. I know, I know, I know, it has nothing to do with me, but damn it, tell me again why love can’t last. Why do we give in to pettiness? Why did they? Why do we so often see gifts as threats? Differences as shortcomings? Why can we not see that our friction could be used to polish one another? This story answered a question that had lingered in my brain my whole music-listening life: If The Beatles were only together 10 years, and the members of the band were so young that entire time, how did they manage to write “Help,” “Fool on the Hill,” “Eleanor Rigby,” “Yesterday,” “A Day in the Life”? They were just 25-year-old boys with a gaggle of babes outside their hotel room door and as much champagne as a young lad could stand. How did they set their minds to such substantive artistic goals? They did it because they were in pain. They knew that love does not last. They knew it as extremely young men. With The Black Album, we get to hear the boys write on adult life: marriage, fatherhood, sobriety, spiritual yearning, the emptiness of material success — “Starting Over,” “Maybe I’m Amazed,” “Beautiful Boy,” “The No No Song,” “God” — and still they are keenly aware of this fact: Love does not last. I don’t want it to be true. I want Lennon/McCartney to write beautifully together forever, but is that really the point? I mean, if the point of a rose was to last forever, it would be made of stone, right? So how do we handle this idea with grace and maturity? If you’re a romantic like me, it’s hard not to long for some indication of healing between the two of them. All signs point that way. When Paul went on SNL recently, he played almost all Lennon. And he did it with obvious joy. Can you listen to “Two of Us” (the last song they wrote side by side) and not hurt a little? What were those two motherless boys who hugged in the middle of the road so long ago thinking as they wrote, “The two of us have memories longer then the road that stretches out ahead”? The dynamic of their breakup, like any divorce, is mysterious. Some say that Paul, the pupil, had surpassed John, the mentor, and they couldn’t reach a new balance. Some say Paul was a little snot who bought the publishing rights out from underneath the other three. Others say that without Brian Epstein, there was no mediator among their egos. Who knows. I played Samantha “Hey Jude” the other day, and, of course, she listened to it over and over. I told her the song had been written by McCartney for Lennon’s son after Lennon’s divorce, and she listened even more intently. George once said that “Hey Jude” was the beginning of the end for the Beatles. Brian Epstein had just died and John and Paul were left alone to run the brand-new Apple label. They recorded “Hey Jude” and “Revolution” as a single. Normally, Brian would decide which song was the A-side and which was the B-side, but now it was up to the boys. John thought “Revolution” was an important political rock song and that they needed to establish themselves as an adult band. Paul thought “Revolution” was brilliant but that The Beatles were primarily a pop band, so they should lead with “Hey Jude.” He knew it would be a monster hit and that the politics should come on a subversive B-side. They had a vote. “Hey Jude” won 3-1. George said that John felt Paul had pulled off a kind of coup d’etat. He wasn’t visibly upset but he began to withdraw. It was no longer his band. The irony/punch line of this story is another story I once heard: When the “Hey Jude”/”Revolution” single was hot off the press, the boys had the mischievous idea of bringing their own new single to a Rolling Stones record release listening party. Mick Jagger says that once the Fab Four arrived and let word of their new single slip — just as Side 1 of the Stones’ big new album was finishing — everyone clamored to hear it. Once The Beatles were on, they just kept flipping the single over and over. Side 2 of Beggars Banquet never even found the needle. Maybe the lesson is: Love doesn’t last, but the music love creates just might. Your mom and I couldn’t make love last, but you are the music, my man.